This recipe was inspired by Rachel Ray’s Shallot and Guinness-Dressed Spinach Salad with Beef and Blue-Butter Croutons. I liked the flavors featured but some of the things she includes, like chopping the spinach, just seems too much. Salad should be flavorful, simple, easy, fresh. Chopping spinach just seems to counter that. 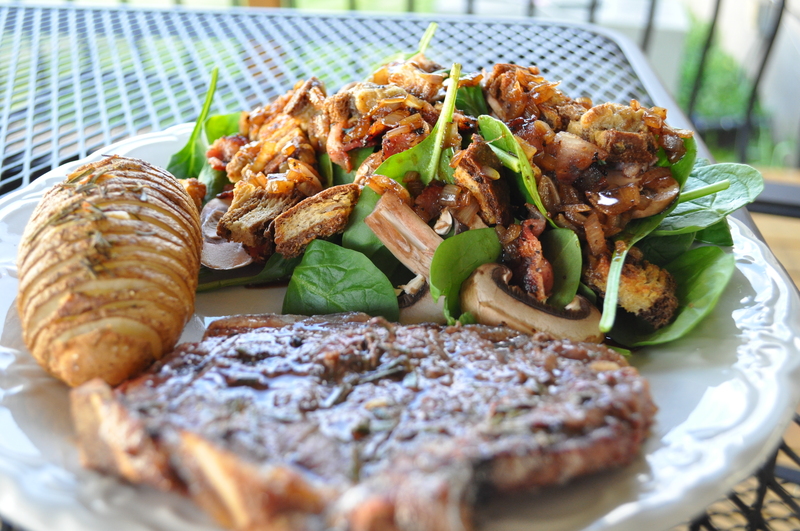 I served the salad with grilled steaks (here is an excellent marinade) and Hasselback Potatoes with Garlic and Rosemary. Pre-heat oven to 325ºF. Place a medium pot over medium heat and melt the butter. Add the blue cheese to the pan and stir to melt the cheese. Add the cubed bread to the pot and stir to evenly coat. Toss the croutons onto a baking sheet and bake until toasted, 15-20 minutes. When the croutons are almost done, place a large skillet over medium-high heat with 1 turn of the pan of olive oil, about 1 tablespoon. Add the bacon to the pan and cook until golden brown and crispy, 3-4 minutes. Add the shallots to the pan and cook until tender, 3-4 minutes. Stir the vinegar, beer and Worcestershire into the skillet and reduce by half, about 1 minute. Stir in the mustard; add salt and pepper to taste. Plate spinach and mushrooms. Top with croutons and bacon. Spoon pipping hot dressing over the salad. When I took the above photo, I hadn’t yet tasted the salad. I decided a couple of bites in it needed a stronger blue cheese flavor; I added a few crumbles…. TA-DA!!! Fantastico salad! Thanks! Did you guys enjoy Ramsey’s? What a beautiful dinner…definitely company-worthy! The spinach salad looks really delicious. I’d probably make that for myself for lunch (and wouldn’t chop the spinach either). It would be very nice for lunch. Especially if you work away from home. It would give you something to look forward to. The dressing is divine! That looks so great. Katherine just did something with wilted spinach. We’ve been eating so many greens, we hadn’t cooked with spinach in ages. Anyway, this really is fantastic. It’s funny how sometimes we forget to make old favorites. Just goes to show you new isn’t always better. The whole plate looks like wow! this looks great! i’m making it for my oscar party on sunday, in honor of “philomena.” how many does this recipe serve? thanks! This salad will serve 2. I can’t wait to hear what you think of it. Enjoy your party!